The world they grow up in will be far different from the one we navigated. 2017 was a year filled with nostalgia thanks to a number of pop culture properties with ties to the past. We got another official Alien film, and Blade Runner came back with new visuals to dazzle us. Meanwhile, “Stranger Things” hearkened back to the Spielbergian fantasy that wowed so many children of the ’80s, and “Twin Peaks” revived Agent Cooper so he could unravel yet another impenetrable mystery from the enigmatic mind of David Lynch. As these films and TV shows remind us, a lot can change over the course of a few decades, and the experiences of one generation can be far different from those that follow closely behind thanks to advances in technology. While the “Stranger Things” kids’ phone usage reminded 30-somethings of their own pre-mobile adolescences, children born in 2018 will probably never know the feeling of being tethered to a landline. A trip to the local megaplex to catch Blade Runner 2049 may have stirred up adults’ memories of seeing the original, but children born this year may never know what it’s like to watch a film on a smaller screen with a sound system that doesn’t rattle the brain. Technology is currently advancing faster than ever before, so what else will kids born today only read about in books or, more likely, on computer screens? Here’s a list of the top 10 things that children born in 2018 will likely never experience. Mobile devices and in-flight entertainment systems have made it pretty easy to stay distracted during the course of a long trip. However, aside from the Concorde, which was decommissioned in 2003, humanity hasn’t done nearly as much to increase the speed of air travel for international jet-setters. Beyond sparsely utilized bullet trains, even the speed of our ground transportation has remained fairly limited. However, recent developments in transportation will likely speed up the travel process, meaning today’s kids may never know the pain of seemingly endless flights and road trips. Supersonic planes are making a comeback and could ferry passengers “across the pond” in as few as 3.5 hours. While these aircraft could certainly make travel faster for a small subset of travelers, physical and cost limitations will likely prevent them from reaching the mainstream. However, hyperloop technology could certainly prove to be an affordable way for travelers to subtract travel time from their itineraries. Already, these super-fast systems have the ability to travel at speeds up to 387 kmh (240 mph). If proposed routes come to fruition, they could significantly cut the time of travel between major cities. For example, a trip from New York to Washington D.C. could take just 30 minutes as opposed to the current five hours. Obtaining a driver’s license is currently a rite of passage for teenagers as they make that transition from the end of childhood to the beginning of adulthood. By the time today’s newborns are 16, self-driving cars may have already put an end to this unofficial ritual by completely removing the need for human operators of motor vehicles. According to the Centers for Disease Control (CDC), an average of six teens between the ages of 16 and 19 died every day in 2015 from injuries sustained in motor vehicle collisions. Since a vast majority of accidents are caused by human error, removing the human from the equation could help to save the lives of people of all ages, so autonomous cars are a serious priority for many. Elon Musk, CEO of Tesla, is confident that his electric and (currently) semi-autonomous car manufacturing company will produce fully autonomous vehicles within the next two years, and several ride-hailing services are already testing self-driving vehicles. Self-driving cars are just a single example of innovations made possible by the advancement of artificial intelligence (AI). Today, we have AI systems that rival or even surpass human experts at specific tasks, such as playing chess or sorting recyclables. However, experts predict that conscious AI systems that rival human intelligence could just be decades away. Advanced robots like Hanson Robotics’ Sophia are already blurring the line between humanity and machines. The next few decades will continue to push boundaries as we inch closer and closer to the singularity. Children born in 2018 may never know what it’s like to join the workforce or go to college at a time when humans are the smartest entities on the planet. Another promising use for AI is communication, and eventually, technology could end the language barrier on Earth. Communication tools such as Skype have already incorporated instantaneous translating capabilities that allow speakers of a few languages to freely converse in real-time, and Google has incorporated translating capabilities into their new headphones. Other companies, such as Waverly Labs, are also working on perfecting the technology that will eventually rival the ability of the Babel fish, an alien species found in the book “The Hitchhiker’s Guide to the Galaxy” that can instantly translate alien languages for its host. Children born in 2018 may find themselves growing up in a world in which anyone can talk to anyone, and the idea of a “foreign” language will seem, well, completely foreign. Technology that improves human communication could radically impact our world, but eventually, we may need to find a way to communicate with extraterrestrial species. Granted, the worlds we reach in the lifetimes of anyone born this year aren’t likely to contain intelligent life, but the first milestones on the path to such a future are likely to be reached in the next few decades. When he’s not ushering in the future of autonomous transportation, Musk is pushing his space exploration company SpaceX to develop the technology to put humans on Mars. He thinks he’ll be able to get a crew to the Red Planet by 2024, so today’s children may have no memory of a time before humanity’s cosmic footprint extended beyond a single planet. Overpopulation is one of the factors that experts point to when they discuss the need for humanity to spread into the cosmos. Urban sprawl has been an issue on Earth for decades, bringing about continued deforestation and the elimination of farming space. A less-discussed problem caused by the continuous spread of urbanization, however, is the increase in noise pollution. Experts are concerned that noise is quickly becoming the next great public health crisis. Data collected by the United Nations estimates that by 2100, 84 percent of the world’s 10.8 billion citizens will live in cities, surrounded by a smorgasbord of sound. This decline in the number of people who live in areas largely free from noise pollution means many of the babies born today will never know what it’s like to enjoy the sound of silence. Urbanization may limit the space available for traditional farming, but thanks to innovations in agriculture, food shortages may soon become a relic of the past. Urban farming is quickly developing into a major industry that is bringing fresh produce and even fish to many markets previously considered food deserts (areas cut off from access to fresh, unprocessed foods). Vertical farming will bring greater access to underserved areas, making it more possible than ever to end hunger in urban areas. Meanwhile, companies are developing innovative ways to reduce food waste, such as by transforming food scraps into sweets or using coffee grounds to grow mushrooms. If these innovations take hold, children born in 2018 could grow up in a world in which every person on Earth has access to all the food they need to live a healthy, happy life. The advent of credit cards may have been the first major blow to the utilization of cash, but it wasn’t the last. Today, paper currency must contend with PayPal, Venmo, Apple Pay, and a slew of other payment options. By the time children born in 2018 are old enough to earn a paycheck, they will have access to even more payment options, and cash could be completely phased out. In the race to dethrone paper currency, cryptocurrencies are a frontrunner. Blockchain technology is adding much needed security to financial transactions, and while the crypto market is currently volatile, experts are still optimistic about its potential to permanently disrupt finance. Today, digital security is a major subject of concern. Hacking can occur on an international level, and with the growth of the Internet of Things (IoT), even household appliances can be points of weakness in the defenses guarding sensitive personal information. Experts are feverishly trying to keep security development on pace with the ubiquity of digitalization, and technological advances such as biometrics and RFID tech are helping. Unfortunately, these defenses still rely largely on typical encryption software, which is breakable. The advent of the quantum computer will exponentially increase computing power, and better security systems will follow suit. By the time children born in 2018 reach adulthood, high-speed quantum encryption could ensure that the digital world they navigate is virtually unhackable. While most of our digital devices currently make use of a typical flat screen, tomorrow’s user interfaces will be far more dynamic, and children born in 2018 may not remember a time when they were limited to a single screen and a keyboard. The development of virtual reality (VR) and augmented reality (AR) have shifted the paradigm, and as these technologies continue to advance, we will increasingly see the incorporation of new capabilities into our computing experience. 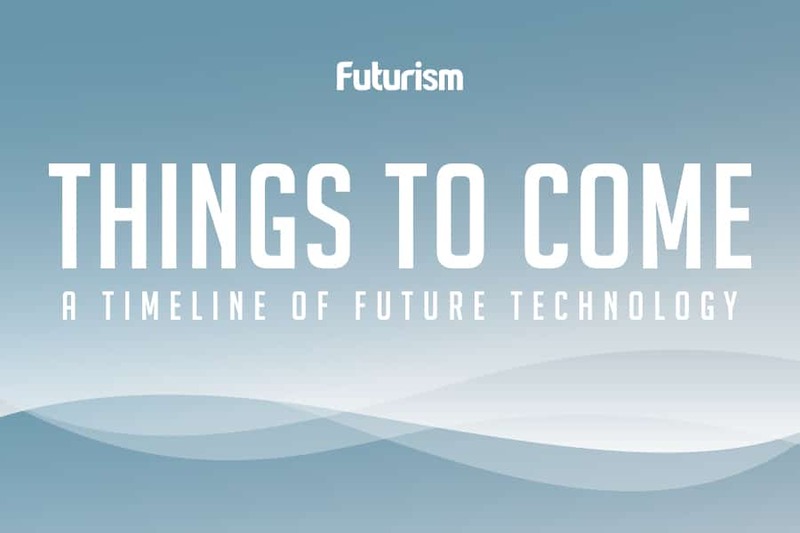 Gesture recognition, language processing, and other technologies will allow for a more holistic interaction with our devices, and eventually, we may find ourselves interacting with systems akin to what we saw in Minority Report.